Before you are ready to attach the caster “Dolly” wheels to your plow, you must first assemble the casters. Refer to your Caster Kit Installation Instructions or here for assembly instructions and pictures. Once the casters are assembled, raise your snowplow fully. Add two jack stands under the plow’s cutting edge for safety. Even though your plow is raised, anything could happen and you do not want the blade dropping unexpectedly. These casters utilize the preexisting holders for plow shoes. If plow shoes are already installed, remove and store in a safe place. outer shoe holders. For a straight blade apply the two small 3 inch caster assemblies in both outer shoe holders. For both blades, adjust the washers as needed either above or below the shoe holder. Be sure to lock each of them in with the quick pin. 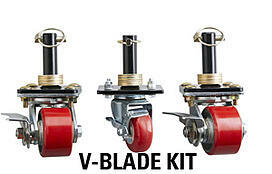 For a V-blade, install the small 3 inch caster assembly into the center shoe holder. For a straight blade, remove the existing kickstand and insert the new caster kickstand with caster in the kickstand’s place. Be sure the new kickstand is then raised to max height and locked into place with the existing spring loaded pin. For a V-blade, remove the safety jack stands and lower the plow in the V-position onto a hard, level surface. 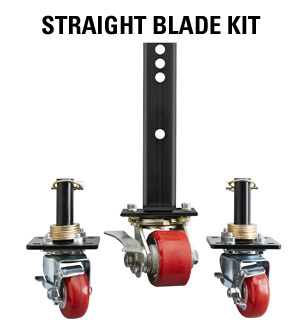 For a straight blade, remove the safety jack stands and lower the plow onto a hard, level surface. Next, lower the kickstand caster assembly until the caster is resting on a hard, level surface. Be sure the spring loaded pin locks into the appropriate hole. With the plow controller in float mode, follow instructions to detach the plow and back your truck away. You can now push the plow to the desired location. All the casters have a locking brake. Step down on the brakes to set as needed. Use the reverse procedure when taking the caster assemblies off. Always be sure to use the safety jack stands. The heavy duty caster wheels feature steel ball bearings for smooth movement and long lasting life, making moving your plow a breeze time and time again. If you have any additional questions on installing your plow caster kit, contact THE BOSS Snowplow any time at – www.bossplow.com. *Kits not available for Power-V DXT, Sport-Duty, UTV/ATV, Skid Steer and 10' Straight-Blade plows.